HB-EGF-like growth factor is synthesized as a membrane-anchored mitogenic and chemotactic glycoprotein. An epidermal growth factor produced by monocytes and macrophages, due to an affinity for heparin is termed HB-EGF. It has been shown to play a role in wound healing, cardiac hypertrophy, and heart development and function. First identified in the conditioned media of human macrophage-like cells, HB-EGF is an 87-amino acid glycoprotein that displays highly regulated gene expression. Ectodomain shedding results in the soluble mature form of HB-EGF, which influences the mitogenicity and chemotactic factors for smooth muscle cells and fibroblasts. The transmembrane form of HB-EGF is the unique receptor for diphtheria toxin and functions in juxtacrine signaling in cells. Both forms of HB-EGF participate in normal physiological processes and in pathological processes including tumor progression and metastasis, organ hyperplasia, and atherosclerotic disease. HB-EGF can bind two locations on cell surfaces: heparan sulfate proteoglycans and EGF-receptor effecting cell to cell interactions. HB-EGF biological activities with these genes influence cell cycle progression, molecular chaperone regulation, cell survival, cellular functions, adhesion, and mediation of cell migration. The NRD1 gene codes for the protein nardilysin, an HB-EGF modulator. 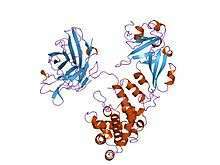 Zinc finger and BTB domain-containing protein 16 and BAG family molecular chaperone regulator function as co-chaperone proteins in processes involving HB-EGF. Recent studies indicate significant HB-EGF gene expression elevation in a number of human cancers as well as cancer-derived cell lines. Evidence indicates that HB-EGF plays a significant role in the development of malignant phenotypes contributing to the metastatic and invasive behaviors of tumors. The proliferative and chemotactic effects of HB-EGF results from the target influence on particular cells including fibroblasts, smooth muscles cells, and keratinocytes. For numerous cell types such as breast and ovarian tumor cells, human epithelial cells and keratinocytes HB-EGF is a potent mitogen resulting in evidenced upregulation of HB-EGF in such specimens. Both in vivo and in vitro studies of tumor formation in cancer dervived cell lines indicate that expression of HB-EGF is essential for tumor development. As a result, studies implementing the use of specific HB-EGF inhibitors and monoclonal antibodies against HB-EGF show the potential for the development of novel therapies for treating cancers by targeting HB-EGF expression. HB-EGF is recognized as an important component for the modulation of cell activity in various biological interactions. Found widely distributed in cerebral neurons and neuroglia, HB-EGF induced by brain hypoxia and or ischemia subsequently stimulates neurogenesis. Interactions between uterine HB-EGF and epidermal growth factor receptors of blastocysts influence embryo-uterine interactions and implantation. Studies show HB-EGF protects intestinal stem cells and intestinal epithelial cells in necrotizing enterocolitis, a disease affecting premature newborns. Associated with a breakdown in gut barrier function, necrotizing enterocolitis may be mediated by HB-EGF effects on intestinal mucosa. HB-EGF expressed during skeletal muscle contraction facilitates peripheral glucose removal, glucose tolerance and uptake. The upregulation of HB-EGF with exercise may explain the molecular basis for the decrease in metabolic disorders such as obesity and type 2 diabetes with regular exercise. ↑ Nanba D, Higashiyama S (February 2004). "Dual intracellular signaling by proteolytic cleavage of membrane-anchored heparin-binding EGF-like growth factor". 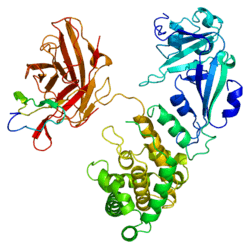 Cytokine Growth Factor Rev. 15 (1): 13–9. doi:10.1016/j.cytogfr.2003.10.002. PMID 14746810. 1 2 Jin K, Mao XO, Sun Y, Xie L, Jin L, Nishi E, Klagsbrun M, Greenberg DA (July 2002). "Heparin-binding epidermal growth factor-like growth factor: hypoxia-inducible expression in vitro and stimulation of neurogenesis in vitro and in vivo". J. Neurosci. 22 (13): 5365–73. PMID 12097488. ↑ Raab G, Klagsbrun M (December 1997). "Heparin-binding EGF-like growth factor". Biochim. Biophys. Acta. 1333 (3): F179–99. doi:10.1016/S0304-419X(97)00024-3. PMID 9426203. ↑ Das SK, Wang XN, Paria BC, Damm D, Abraham JA, Klagsbrun M, Andrews GK, Dey SK (May 1994). "Heparin-binding EGF-like growth factor gene is induced in the mouse uterus temporally by the blastocyst solely at the site of its apposition: a possible ligand for interaction with blastocyst EGF-receptor in implantation". Development. 120 (5): 1071–83. PMID 8026321. ↑ Nishi E, Prat A, Hospital V, Elenius K, Klagsbrun M (July 2001). "N-arginine dibasic convertase is a specific receptor for heparin-binding EGF-like growth factor that mediates cell migration". EMBO J. 20 (13): 3342–50. doi:10.1093/emboj/20.13.3342. PMC 125525 . PMID 11432822. ↑ Nanba D, Mammoto A, Hashimoto K, Higashiyama S (November 2003). "Proteolytic release of the carboxy-terminal fragment of proHB-EGF causes nuclear export of PLZF". J. Cell Biol. 163 (3): 489–502. doi:10.1083/jcb.200303017. PMC 2173632 . PMID 14597771. ↑ Nanba D, Toki F, Higashiyama S (July 2004). "Roles of charged amino acid residues in the cytoplasmic domain of proHB-EGF". Biochem. Biophys. Res. Commun. 320 (2): 376–82. doi:10.1016/j.bbrc.2004.05.176. PMID 15219838. ↑ Lin J, Hutchinson L, Gaston SM, Raab G, Freeman MR (August 2001). "BAG-1 is a novel cytoplasmic binding partner of the membrane form of heparin-binding EGF-like growth factor: a unique role for proHB-EGF in cell survival regulation". J. Biol. Chem. 276 (32): 30127–32. doi:10.1074/jbc.M010237200. PMID 11340068. ↑ Hospital V, Prat A (October 2004). "Nardilysin, a basic residues specific metallopeptidase that mediates cell migration and proliferation". Protein Pept. Lett. 11 (5): 501–8. doi:10.2174/0929866043406508. PMID 15544571. ↑ Miyamoto S, Yagi H, Yotsumoto F, Kawarabayashi T, Mekada E (May 2006). "Heparin-binding epidermal growth factor-like growth factor as a novel targeting molecule for cancer therapy". Cancer Sci. 97 (5): 341–7. doi:10.1111/j.1349-7006.2006.00188.x. PMID 16630129. ↑ Nolan TM, Di Girolamo N, Coroneo MT, Wakefield D (January 2004). "Proliferative effects of heparin-binding epidermal growth factor-like growth factor on pterygium epithelial cells and fibroblasts". Invest. Ophthalmol. Vis. Sci. 45 (1): 110–3. doi:10.1167/iovs.03-0046. PMID 14691161. ↑ Miyazono K (January 2012). "Ectodomain shedding of HB-EGF: a potential target for cancer therapy". J. Biochem. 151 (1): 1–3. doi:10.1093/jb/mvr120. PMID 21976708. ↑ Iwamoto R, Mekada E (2006). "ErbB and HB-EGF signaling in heart development and function". Cell Struct. Funct. 31 (1): 1–14. doi:10.1247/csf.31.1. PMID 16508205. ↑ Zhang H, Sunnarborg SW, McNaughton KK, Johns TG, Lee DC, Faber JE (May 2008). "Heparin-binding epidermal growth factor-like growth factor signaling in flow-induced arterial remodeling". Circ. Res. 102 (10): 1275–85. doi:10.1161/CIRCRESAHA.108.171728. PMC 2752633 . PMID 18436796. ↑ Shirakata Y, Kimura R, Nanba D, Iwamoto R, Tokumaru S, Morimoto C, Yokota K, Nakamura M, Sayama K, Mekada E, Higashiyama S, Hashimoto K (June 2005). "Heparin-binding EGF-like growth factor accelerates keratinocyte migration and skin wound healing". J. Cell. Sci. 118 (Pt 11): 2363–70. doi:10.1242/jcs.02346. PMID 15923649. ↑ Marikovsky M, Breuing K, Liu PY, Eriksson E, Higashiyama S, Farber P, Abraham J, Klagsbrun M (May 1993). "Appearance of heparin-binding EGF-like growth factor in wound fluid as a response to injury". Proc. Natl. Acad. Sci. U.S.A. 90 (9): 3889–93. doi:10.1073/pnas.90.9.3889. PMC 46411 . PMID 8483908. ↑ Leach RE, Khalifa R, Armant DR, Brudney A, Das SK, Dey SK, Fazleabas AT (September 2001). "Heparin-binding EGF-like growth factor modulation by antiprogestin and CG in the baboon (Papio anubis)". J. Clin. Endocrinol. Metab. 86 (9): 4520–8. doi:10.1210/jc.86.9.4520. PMID 11549702. ↑ Chen CL, Yu X, James IO, Zhang HY, Yang J, Radulescu A, Zhou Y, Besner GE (March 2012). "Heparin-binding EGF-like growth factor protects intestinal stem cells from injury in a rat model of necrotizing enterocolitis". Lab. Invest. 92 (3): 331–44. doi:10.1038/labinvest.2011.167. PMC 3289750 . PMID 22157721. ↑ Fukatsu Y, Noguchi T, Hosooka T, Ogura T, Kotani K, Abe T, Shibakusa T, Inoue K, Sakai M, Tobimatsu K, Inagaki K, Yoshioka T, Matsuo M, Nakae J, Matsuki Y, Hiramatsu R, Kaku K, Okamura H, Fushiki T, Kasuga M (June 2009). "Muscle-specific overexpression of heparin-binding epidermal growth factor-like growth factor increases peripheral glucose disposal and insulin sensitivity". Endocrinology. 150 (6): 2683–91. doi:10.1210/en.2008-1647. PMID 19264873. Higashiyama S, Lau K, Besner GE, et al. (1992). "Structure of heparin-binding EGF-like growth factor. Multiple forms, primary structure, and glycosylation of the mature protein". J. Biol. Chem. 267 (9): 6205–12. PMID 1556128. Yoshizumi M, Kourembanas S, Temizer DH, et al. (1992). "Tumor necrosis factor increases transcription of the heparin-binding epidermal growth factor-like growth factor gene in vascular endothelial cells". J. Biol. Chem. 267 (14): 9467–9. PMID 1577791. Higashiyama S, Abraham JA, Miller J, et al. (1991). "A heparin-binding growth factor secreted by macrophage-like cells that is related to EGF". Science. 251 (4996): 936–9. doi:10.1126/science.1840698. PMID 1840698. Iwamoto R, Senoh H, Okada Y, et al. (1991). "An antibody that inhibits the binding of diphtheria toxin to cells revealed the association of a 27-kDa membrane protein with the diphtheria toxin receptor". J. Biol. Chem. 266 (30): 20463–9. PMID 1939101. Hayes H, Kaneda Y, Uchida T, Okada Y (1988). "Regional assignment of the gene for diphtheria toxin sensitivity using subchromosomal fragments in microcell hybrids". Chromosoma. 96 (1): 26–32. doi:10.1007/BF00285879. PMID 3436221. Bennett KL, Jackson DG, Simon JC, et al. (1995). "CD44 isoforms containing exon V3 are responsible for the presentation of heparin-binding growth factor". J. Cell Biol. 128 (4): 687–98. doi:10.1083/jcb.128.4.687. PMC 2199889 . PMID 7532176. Pathak BG, Gilbert DJ, Harrison CA, et al. (1995). "Mouse chromosomal location of three EGF receptor ligands: amphiregulin (Areg), betacellulin (Btc), and heparin-binding EGF (Hegfl)". Genomics. 28 (1): 116–8. doi:10.1006/geno.1995.1116. PMID 7590736. Mitamura T, Higashiyama S, Taniguchi N, et al. (1995). "Diphtheria toxin binds to the epidermal growth factor (EGF)-like domain of human heparin-binding EGF-like growth factor/diphtheria toxin receptor and inhibits specifically its mitogenic activity". J. Biol. Chem. 270 (3): 1015–9. doi:10.1074/jbc.270.3.1015. PMID 7836353. Hashimoto K, Higashiyama S, Asada H, et al. (1994). "Heparin-binding epidermal growth factor-like growth factor is an autocrine growth factor for human keratinocytes". J. Biol. Chem. 269 (31): 20060–6. PMID 8051092. Kobrin MS, Funatomi H, Friess H, et al. (1994). "Induction and expression of heparin-binding EGF-like growth factor in human pancreatic cancer". Biochem. Biophys. Res. Commun. 202 (3): 1705–9. doi:10.1006/bbrc.1994.2131. PMID 8060360. Thompson SA, Higashiyama S, Wood K, et al. (1994). "Characterization of sequences within heparin-binding EGF-like growth factor that mediate interaction with heparin". J. Biol. Chem. 269 (4): 2541–9. PMID 8300582. Fen Z, Dhadly MS, Yoshizumi M, et al. (1993). "Structural organization and chromosomal assignment of the gene encoding the human heparin-binding epidermal growth factor-like growth factor/diphtheria toxin receptor". Biochemistry. 32 (31): 7932–8. doi:10.1021/bi00082a014. PMID 8347598. Elenius K, Paul S, Allison G, et al. (1997). "Activation of HER4 by heparin-binding EGF-like growth factor stimulates chemotaxis but not proliferation". EMBO J. 16 (6): 1268–78. doi:10.1093/emboj/16.6.1268. PMC 1169725 . PMID 9135143. Louie GV, Yang W, Bowman ME, Choe S (1998). "Crystal structure of the complex of diphtheria toxin with an extracellular fragment of its receptor". Mol. Cell. 1 (1): 67–78. doi:10.1016/S1097-2765(00)80008-8. PMID 9659904. Borer JG, Park JM, Atala A, et al. (1999). "Heparin-binding EGF-like growth factor expression increases selectively in bladder smooth muscle in response to lower urinary tract obstruction". Lab. Invest. 79 (11): 1335–45. PMID 10576204. Duque JL, Adam RM, Mullen JS, et al. (2001). "Heparin-binding epidermal growth factor-like growth factor is an autocrine mediator of human prostate stromal cell growth in vitro". J. Urol. 165 (1): 284–8. doi:10.1097/00005392-200101000-00080. PMID 11125426. Lin J, Hutchinson L, Gaston SM, et al. (2001). "BAG-1 is a novel cytoplasmic binding partner of the membrane form of heparin-binding EGF-like growth factor: a unique role for proHB-EGF in cell survival regulation". J. Biol. Chem. 276 (32): 30127–32. doi:10.1074/jbc.M010237200. PMID 11340068.